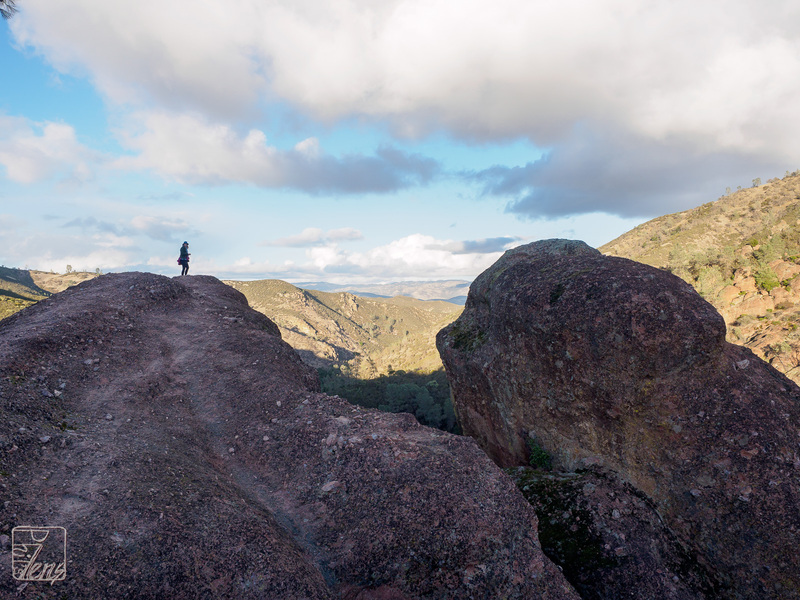 We visited Northern California to get a break from the New England winter weather. Not only was it considerably warmer than our home climate this time of year, we got to visit with my son and daughter-in-law as well; they live in San Francisco. In the first part of the trip, we stayed in Aptos at the northern edge of Monterey Bay, just south of Santa Cruz. 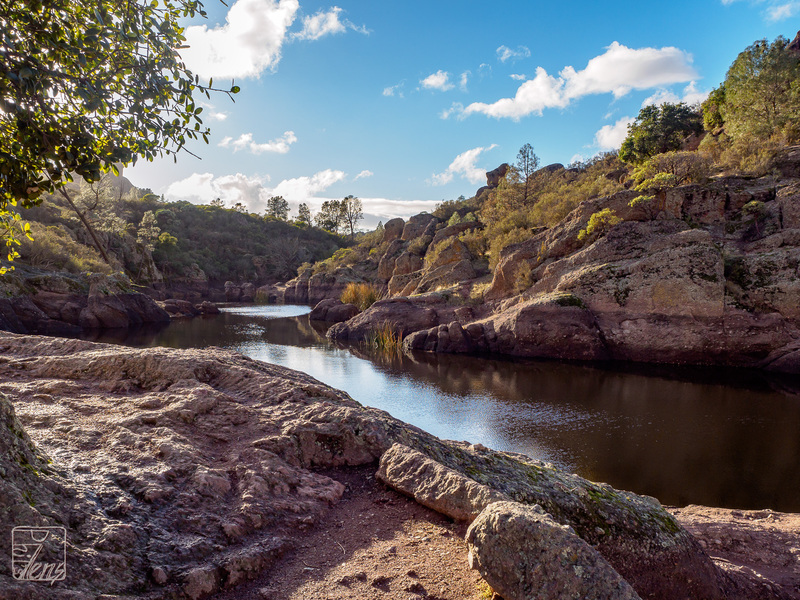 We visited Pinnacles National Park on our first full day after arrival. I'm pretty sure I was there once before, but it was many decades ago. Other guests at the B&B where we were staying suggested we go to the east entrance, and we decided to follow their advice. 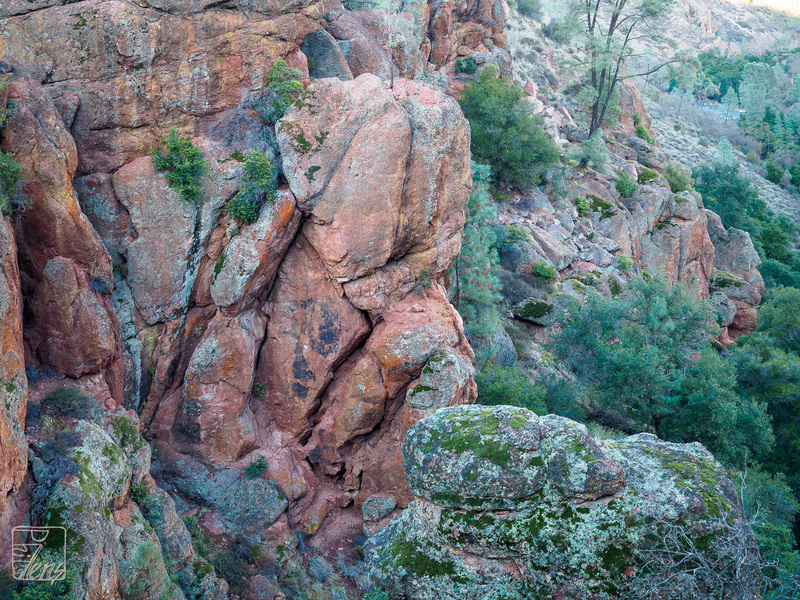 Pinnacles has a west and an east side; there are no direct roads connecting the two sides. 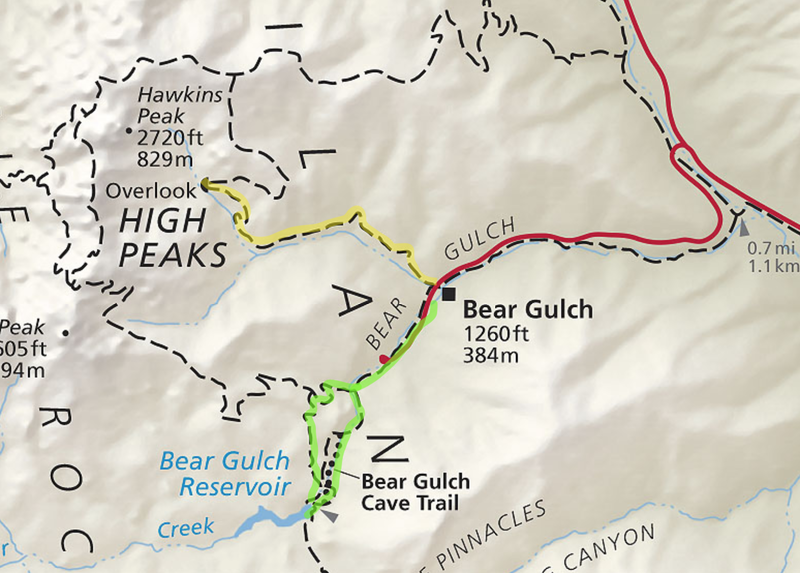 After parking in the Bear Gulch parking lot, we hiked the Overlook Trail (yellow) and the Bear Gulch Cave Trail (green). 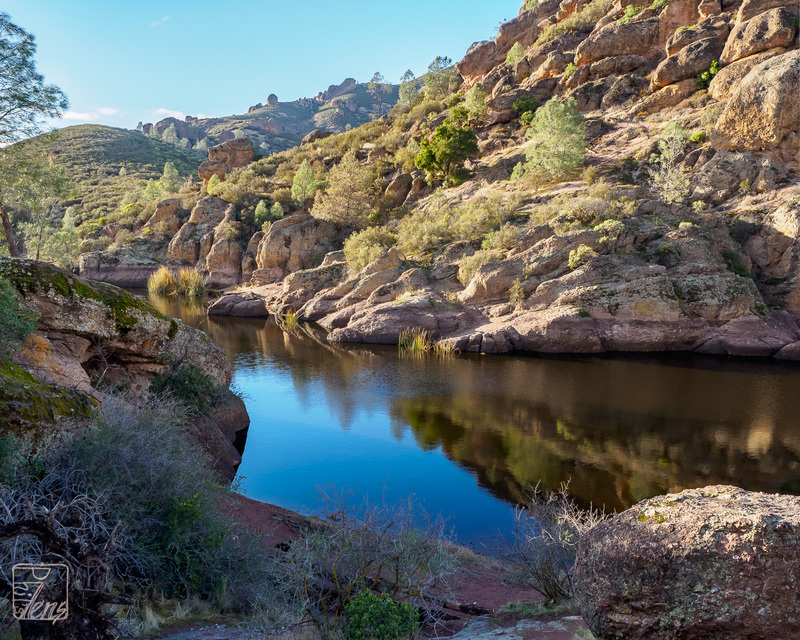 While the Outlook Trail was pleasant, it wasn't as interesting as the hike up to the Bear Gulch Reservoir via the Bear Gulch Cave. 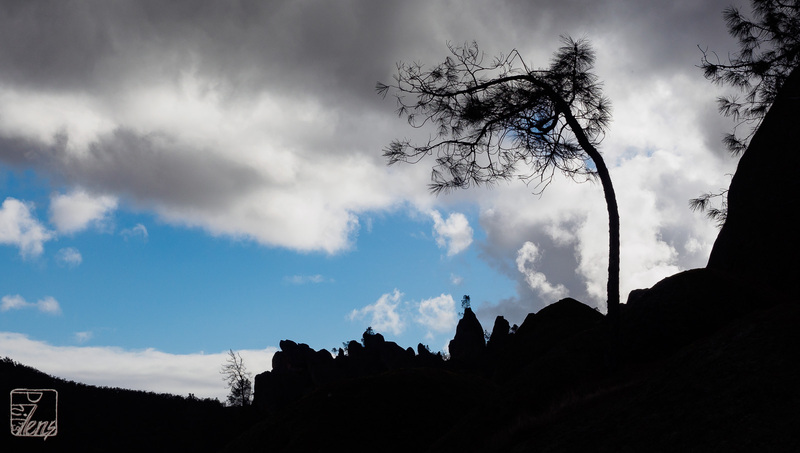 There was a light rain shower twice during the Outlook Trail hike, but it didn't bother us too much. We enjoyed the striking smooth red bark of some of the trees on the trails. 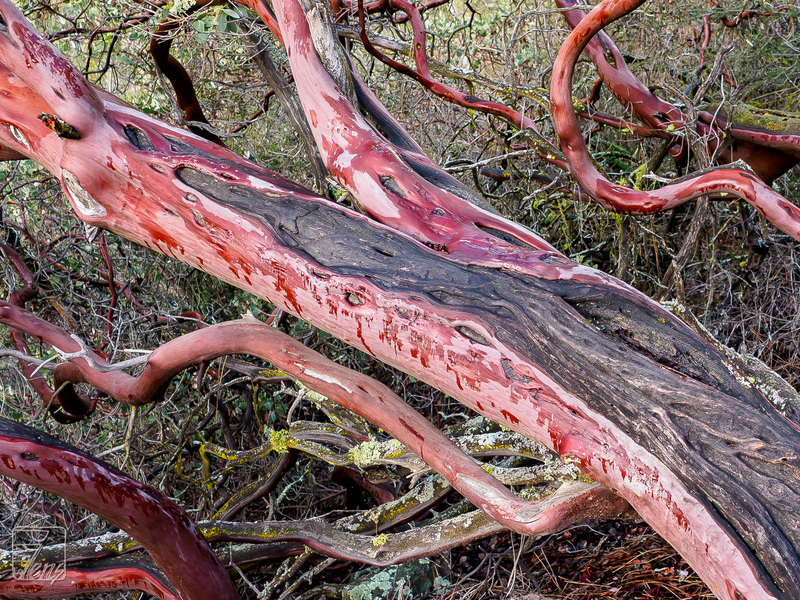 After returning home, and doing a bit of googling, I've decided this is a Manzanita tree. I've seen them before when I lived in California, but had forgotten what a unique and colorful appearance they have. 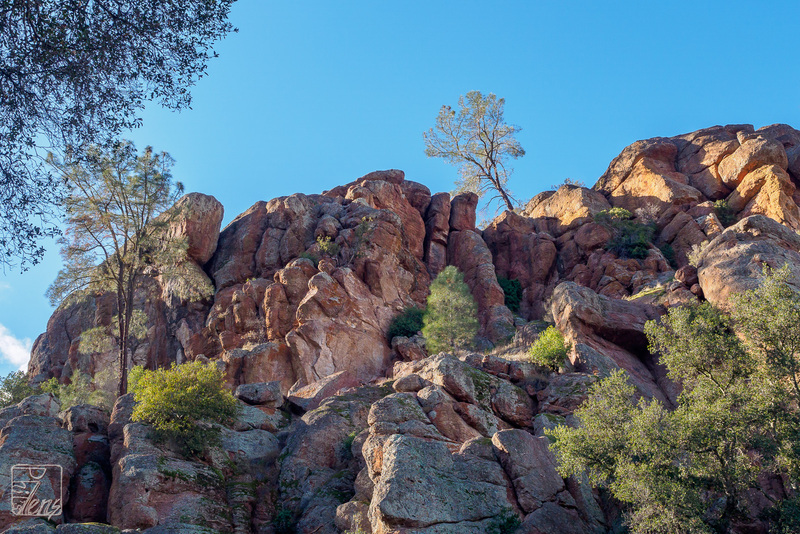 View of some "pinnacle" formations towering over Bear Gulch. 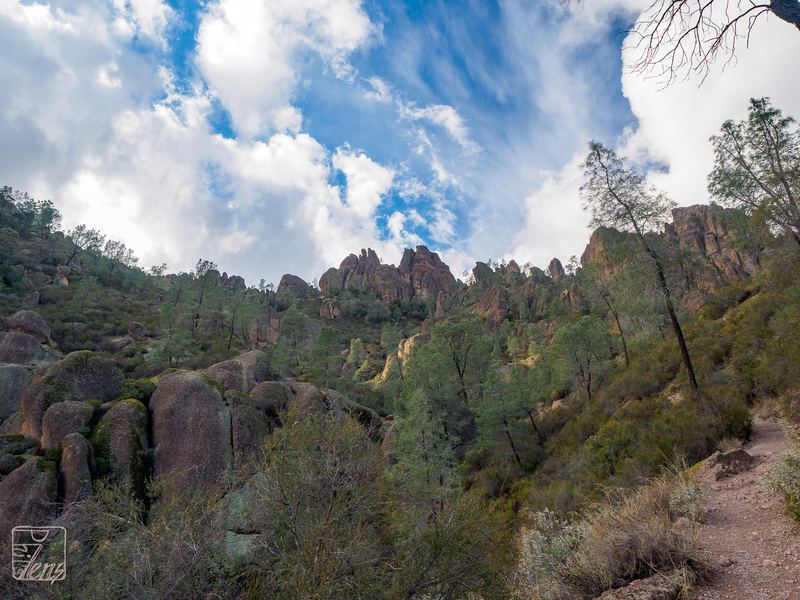 The remaining photos are from the Bear Gulch Cave trail loop. 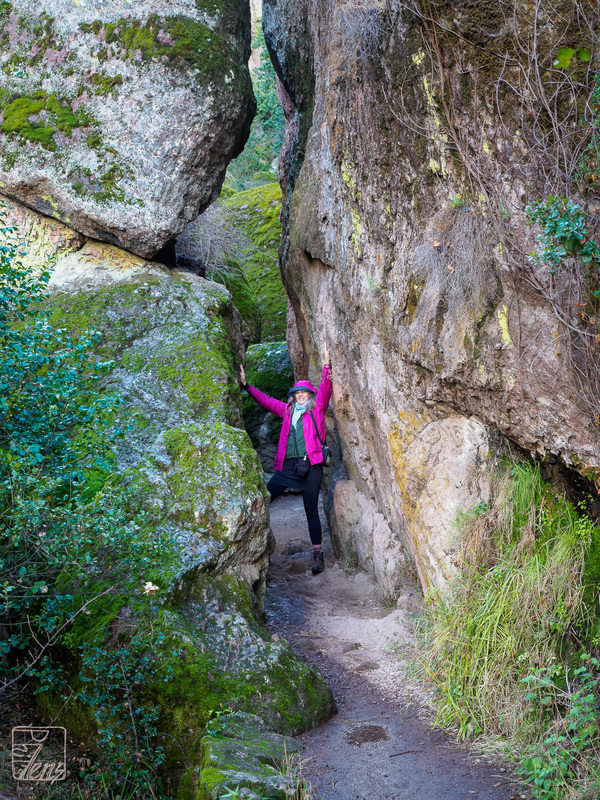 Here's Deb demonstrating her massive strength to keep these rocks from colliding. 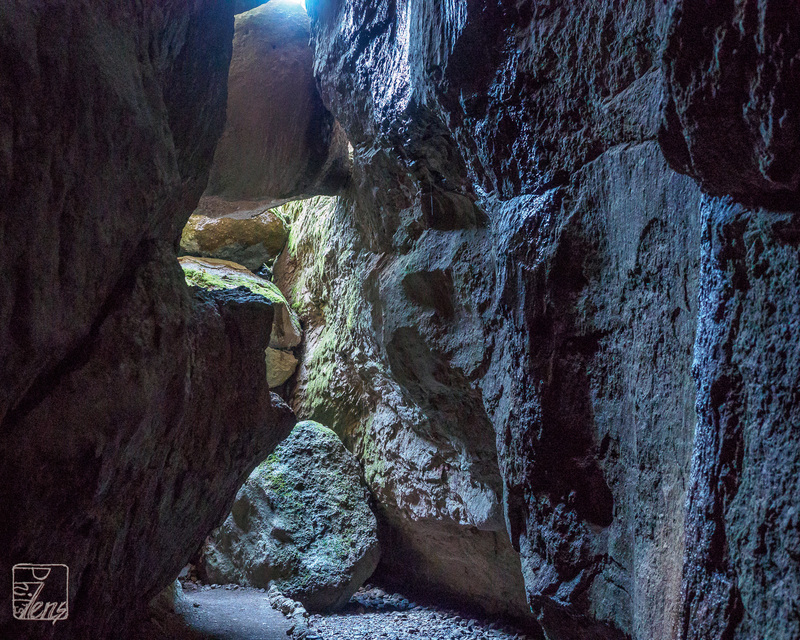 This gap occurs right before the entrance to the cave. The cave was quite a joy to climb through. It had steps inside, and one could stand up most of the way except in a few places. Parts of it were extremely dark; we had to use our cell phone flashlights to see where we were going. 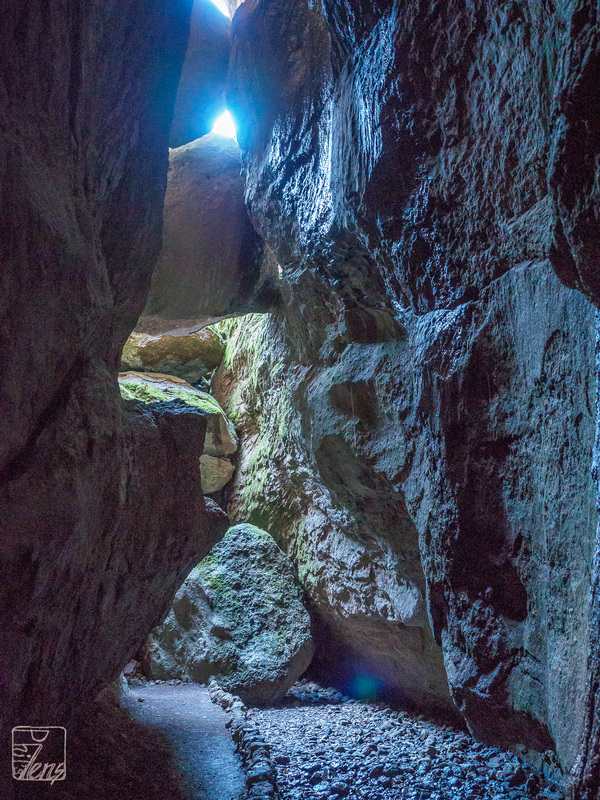 The next two cave pictures are of a particularly colorful section using two different aspect ratios. These were at ISO 5000 at 1/20 and 1/25 seconds respectively. I do not recall seeing the color on the rock with my eye. Nice that the camera reveals it. 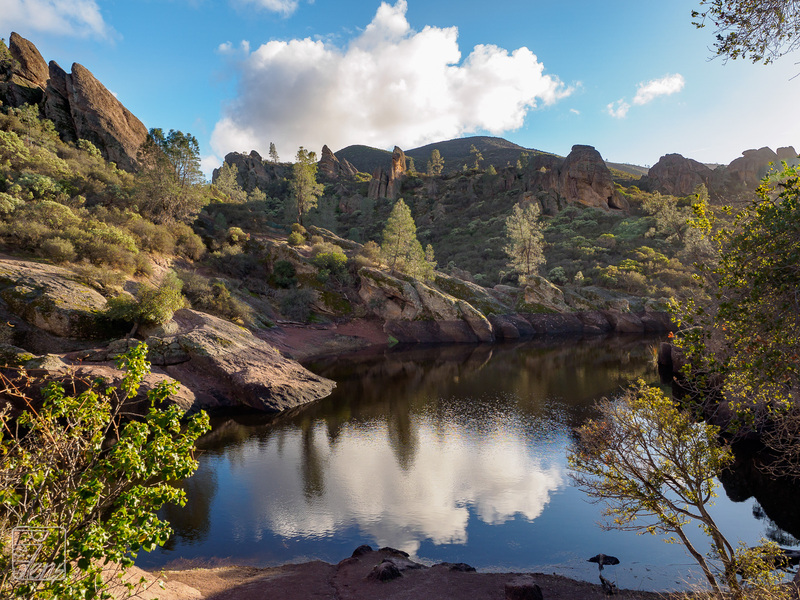 After exiting the cave, we had an adventure figuring out which piles of rocks to crawl though to find the stunning Bear Gulch Reservoir. 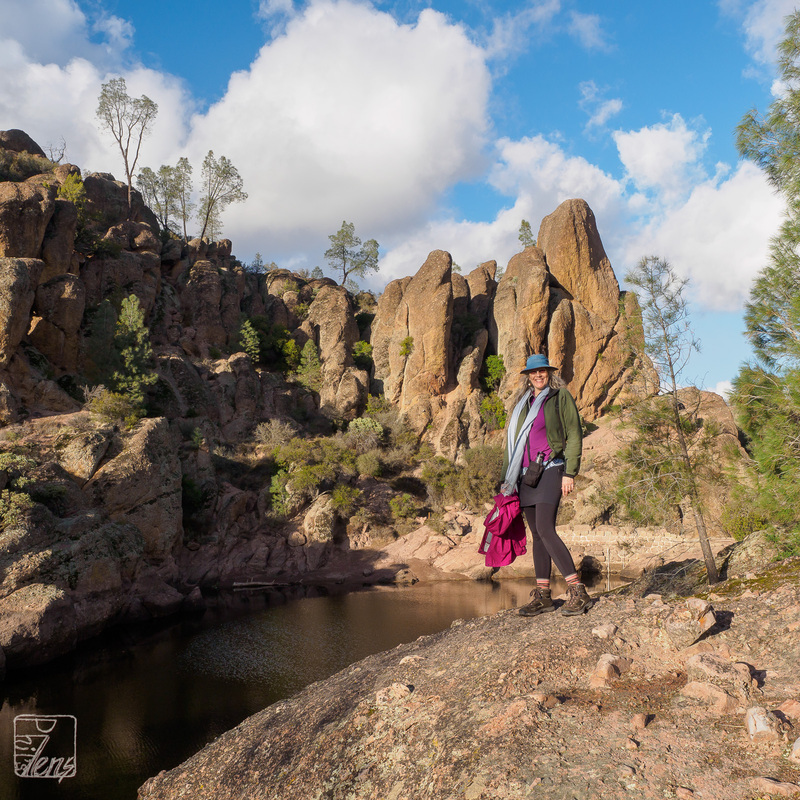 On the way back down, after the lovely reservoir visit, Deb used her great hiking boots with good grip to take a detour out onto a steep outcropping to see a magnificent view of the valley below. Here she is standing atop big rocks. Did I say these were BIG rocks? 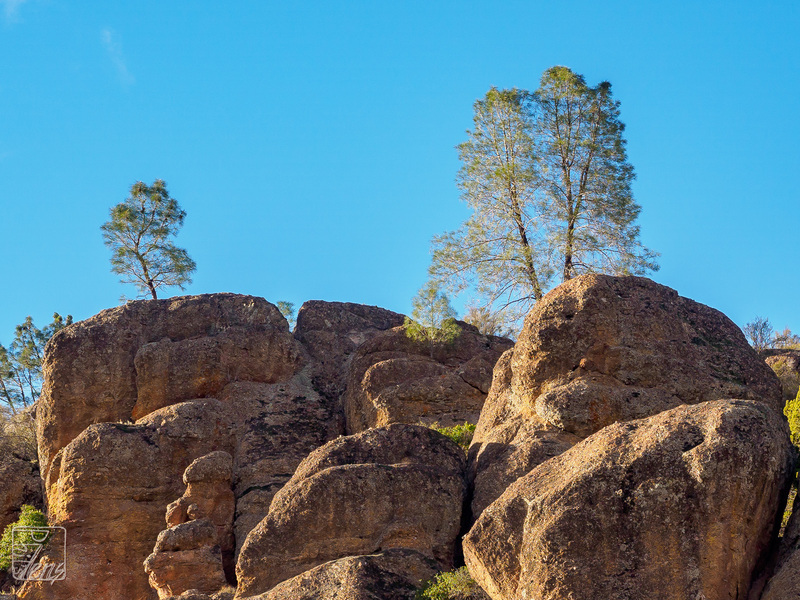 The Pinnacles terrain is unique and impressive! All photos © 2018, all rights reserved. Contact philslens@gmail.com for licensing or to order prints.